When Pat took over the ownership of Decorfolia in 2000 we made a conscious effort to become as ecologically sound as possible. You may have already read on our web site about our recycling of plant pots, leca, all the green waste from our contracts and nursery, the composting toilet we have here, our wildlife meadow, Mark's bee hives etc. But our efforts do not stop there as we are always looking for new ways to reduce our carbon footprint. On 1 December 2007, 1&1 Internet started to supply all European data centres and most office locations with electrical power from renewable resources such as wind, water, or solar energy. 1&1's past and present electrical power provider Stadtwerke Karlsruhe will supply both its own 'green' power and will buy additional energy from other suppliers within the Renewable Energy Certificate System, RECS. 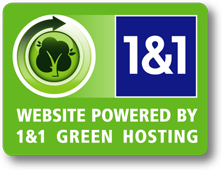 1&1's involvement helps to save about 30,000 tons of CO2. 1&1 not only desires clean energy, but also wants to use as little energy as possible. Thus, for example, for many years 1&1 has used highly efficient power supplies with less than 20 per cent heat loss and omits any unnecessary components within its servers. As soon as the outside temperature falls below 10 degrees, 1&1 cools its data centre using open-air coolers that work without energy-hungry compressors. Software too can help save electrical power - based on a Linux platform, 1&1 has developed its own operating system that enables the data of up to 10,000 customers to fit on one server and thus saves valuable resources.